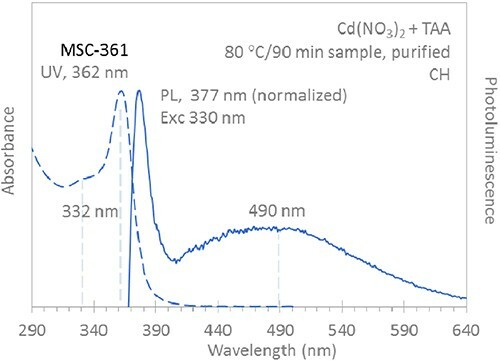 We report, for the first time, the synthesis of CdS magic-size clusters (MSCs) which exhibit a single sharp absorption peaking at ∼ 361 nm, along with sharp band edge photoemission at ∼ 377 nm and broad trap emission peaking at ∼ 490 nm. These MSCs are produced in a single-ensemble form without the contamination of conventional quantum dots (QDs) and/or other-bandgap clusters. They are denoted as MSC-361. We present the details of several controlled syntheses done in oleylamine (OLA), using Cd(NO3)2 or Cd(OAc)2 as a Cd source and thioacetamide (TAA) or elementary sulfur (S) as a S source. A high synthetic reproducibility of the reaction of Cd(NO3)2 and TAA to single-ensemble MSC-361 is achieved, the product of which is not contaminated by other bandgap clusters and/or QDs. In some cases, the reaction product exhibits an additional absorption peak at ∼ 322 nm. We demonstrate that the two peaks, at 361 and 322 nm, do not evolve synchronously. Therefore, the 322 nm peak is not a higher order electronic transition of MSC-361, but due to the presence of another ensemble, namely MSC-322. The present study suggests that there is an outstanding need for the development of a physical model to narrow the knowledge gap regarding the electronic structure in these colloidal semiconductor CdS MSCs. 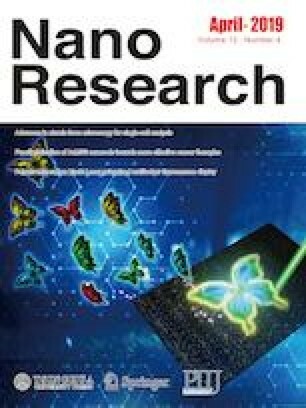 Supplementary materials (additional optical absorption and emission spectra, and TEM, and XRD) is available in the online version of this article at https://doi.org/10.1007/s12274-019-2386-8. K. Y. acknowledges financial support from the National Natural Science Foundation of China(Nos. 21773162 and 21573155), the Fundamental Research Funds for the Central Universities (No. SCU2015A002), the State Key Laboratory of Polymer Materials Engineering of Sichuan University (No. sklpme2018-2-08), and the Open Project of Key State Laboratory for Supramolecular Structures and Materials of Jilin University for SKLSSM 201830. H. F. and W. H. thank the National Major Scientific and Technological Special Project for “Significant New Drugs Development” (Nos. 2018ZX09201009-005-004 and 2018ZX09201009-005-001). We thank Sichuan Univ of Analytical & Testing Center. We are in debt to Dr. Shanling Wang (Analytical & Testing Center, Sichuan University) for TEM.